Transform Your Church with Ministry Teams ReviewThe book addresses a key question - "Is there a better way to 'Do Ministry?' than is seen in most churches today?" Ministry teams are not simply a name change for committees. Rather, the type of ministry team proposed by Ott has at its core a commitment to building relationships within the team, a dual-focus (building up the team as well as carrying out the tasks of ministry), and connecting like a small-group. Ministry teams foster friendships among their members and 'grow' them into disciples. Ott describes several outstanding benefits of ministry teams as they address two vital needs within the church: growing disciples and growing leaders. "The ministry team becomes the consummate opportunity for leadership development within the church because it blends at least three different leader-developing processes into a single composite entity." (referring to small groups, apprenticing, and 'with-me' ministry). 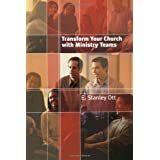 Throughout the book Ott helps to understand the distinctiveness of ministry teams, how to shift a congregation towards such teams, what they look like and what they do, developing team leadership. They work in the context of the vision and practices of the congregation. He takes the idea of 'never launch a new ministry without a leader' one step further: 'never launch a new ministry without a core leadership team for the new ministry'. If there's one aspect of ministry teams that could have used further attention, that would be how the practices described in the book would be integrated in a church that already has a strong small groups ministry. It's not clear whether ministry teams are meant to supplement or replace a small groups ministry. Want to learn more information about Transform Your Church with Ministry Teams?